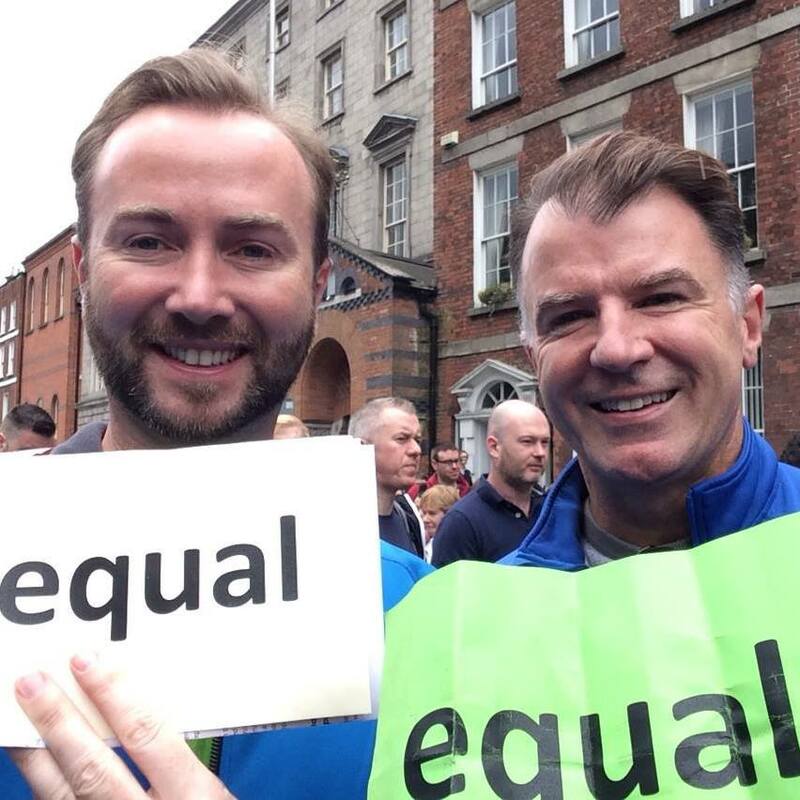 There have been many emotional and logical treatises made over the last couple of months, in favor of a Yes vote in Ireland’s marriage referendum today. If you haven’t been convinced yet, I’d like to share one last compelling reason to vote yes (in fact, when all is said and done, I think this is the best reason of all). In the photo there you see my brother, Michael on the left and on the right is his civil partner, Des. Des is a doctor. My mother, Cecilia, raised her children with very clear expectations; one of us was to marry a doctor. Des is Cecilia’s last chance at achieving the dream that she has held dear for over forty years now. Please, get up and go vote yes right now, and make Cecila’s dream come true. Thank you, Ireland. Rita Walsh was an adventurer. 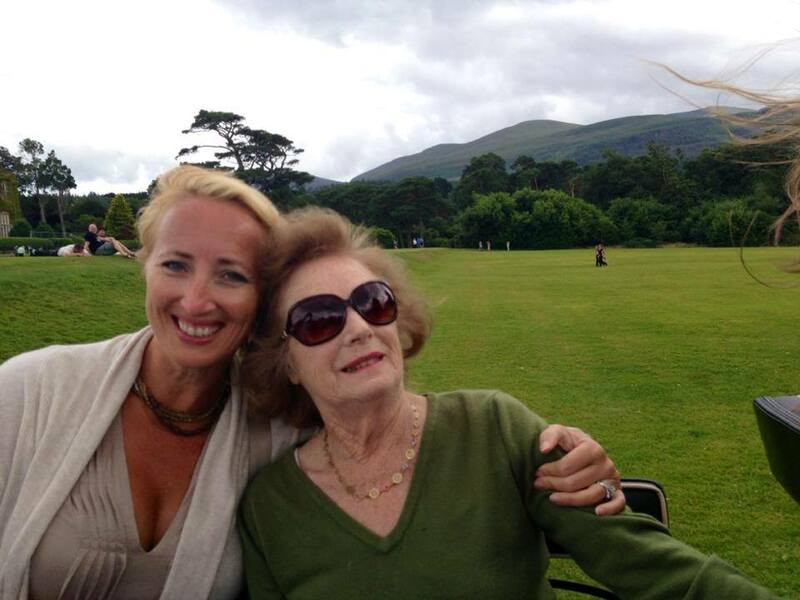 She was a world traveler and an avid explorer of the wilds of West Cork and Kerry. Even at 82, she was wildly independent; living alone and tending her half acre garden a few miles outside of Blackpool. Prior to a Walsh family reunion in the summer of 2013, family traits were being discussed. Someone offered optimism as a potential. “Optimism? I should think so,” said Rita, “I just planted three trees”. We laughed till we cried. Rita was going nowhere anytime soon; another Walsh trait is longevity. Never having had children of her own, Rita was a deeply embedded and adored feature of each of her brothers’ families. We felt certain we would have the pleasure of Rita’s company for many more years to come. Shortly after the reunion, Rita was involved in a car accident. She was pretty badly beaten up, and her shoulder and arm hurt. She applied her usual positive outlook to it all, and we applied our Walsh optimism to her chances of a full recovery. She would be fine. Rita did heal. She had physical therapy, and the bruises disappeared. About six months later, early in 2014, she began to experience low back pain. She went to see her GP. He attributed the pain to a remnant of the car accident. Rita was happy to accept that diagnosis. Like many of her generation, much as she liked her GP, Rita wasn’t a big fan of going to the doctor. There was always the fear that he’d find something wrong with her. “I’ll be grand”, she would said. She wasn’t a complainer. The pain continued, and Rita didn’t say much about it to anyone. Possibly, she thought it was just part of getting older. We could sense there was a discomfort though. She didn’t verbalize it, but she would, uncharacteristically, refuse invitations and outings. By Christmas that year, she began to share more frequently that her back was hurting. We noticed that she wasn’t eating much. When asked if she had talked to her doctor, and she said yes. By the end of January she was losing weight, and low on energy. My father insisted on driving her to the doctor. “I suppose I’d better tell him everything this time”, she said on the drive in. This alarmed my father. What hadn’t she been telling him? What hadn’t she been telling us? Whatever it was, was sufficiently concerning that her doctor had an appointment for her at Cork Maternity Hospital to have tests done just three days later. That Thursday Rita went in, for what she expected to be an outpatient visit, but ended up being admitted. We assume they broke the news to her that she had cancer the next day. My father, brother and youngest sister were in London for my brother-in-law’s Masters’ graduation from Kings’ College. My other sister, who lives close to me in Orlando, called Rita in the hospital. She sounded very down, and told her that it was bad, and she didn’t want to talk about it. Never once, in the coming weeks, did Rita mention the word cancer. A gamut of tests were run and it became apparent that not only did Rita have cancer, but it was ovarian cancer, and quite advanced. When Dad, her health surrogate, returned to Cork on Monday, Dr. Matt Hewitt told him that there would be no cure; that it was just a matter of making her comfortable and extending life. In Orlando, I sent my passport away for renewal, planning on bringing my children home to spend the summer with Rita, just in case it would be her last. The family plan to all join us in Orlando the following Christmas was also being revised. Instead we’d go to Cork to spend the season with Rita. After a few days of tests, Rita was discharged. Dad invited her to stay with him. She was in a lot of pain. She had to prop mounds of cushions behind her in an effort to get comfortable. She couldn’t sleep well. She wasn’t eating still, and when she did, whatever she got down, came right back up. She still managed to smile, and to sound cheerful when I called her. A few days after she was released, some tests results came back showing a lot of fluid on her lungs. Dr. Hewitt’s nurse called and asked Dad to bring her back into CMH so they could drain it. She went back in on Thursday. She began to sound brighter once the fluid was drained, and she was on stronger pain medication. She had loads of visitors and the nursing staff was wonderful. She told me all about the parade of handsome doctors. She mused that being handsome was a job requirement at CMH. Knowing Rita, there was a lot of batting of eyelashes going on! On Sunday she took a turn for the worse, and things began to devolve with a speed we couldn’t have imagined. Her kidneys were shutting down. They put her on morphine. I shared this news on a private Facebook page I has started to share news of Rita’s condition with my many cousins who, like me, adored Rita. My brother in law called me from Ireland Sunday night. He’s a doctor, and he told me that it was time for my sister and I took come home. That she was being given morphine, he advised, was not a good indicator. Audrey and I were on a plane to Cork on Monday afternoon. Sadly, disembarking our connecting flight in London, we got the call that Rita had passed. It was Tuesday, February 17th. Just over two weeks since Rita had been diagnosed with ovarian cancer. There would be no long summer sitting in her garden with her, and no more Christmas memories. Rita’s adventures had come to an end. The staff in CMH were amazing. Dr. Hewitt and the nurses there had become very attached to Rita in her short stay. They allowed her to remain in her bed until Audrey and I could get there to say goodbye to the woman we had loved so much our entire lives. I sat by her bed, tears flowing, as I read aloud the letters my three children had written to her, and given to me to deliver. Two days later Rita was laid to rest; the number of people attending her funeral was testament to the lives that her own enthusiasm, energy and love had touched. We wish she would have spoken up about her symptoms. We wish she had paid better attention to herself. We wish we had known more. Maybe things could have been different, and my children would, right now, be looking forward to long summer days with Rita, going on picnics and jaunting car rides, instead of knowing that their last communications with her are buried with six feet down in St. Finbarr’s cemetery. Rita was part of a generation who don’t like to talk about their health, other than in the vaguest of terms. That is especially true when it comes to female problems. I do wish that Rita had known the symptoms of ovarian cancer. I do wish that we had. Maybe we could have put two and two together a bit faster. Though not doubting the emphatics of her statements of well-being, we wish her doctor had pressed her a little harder about her back pain. Having no children put her at a higher risk for ovarian cancer. There are a lot of would have, could haves. If you have a “Rita” in your life, please be sure to familiarize yourself with the symptoms of ovarian cancer. Don’t be shy when dealing with family members who might be uncomfortable visiting a doctor, or admitting to not feeling well. If you are a “Rita”, and have concerns about symptoms you are experiencing, please spare your family the pain we are enduring, and go and talk to your doctor, openly and honestly.